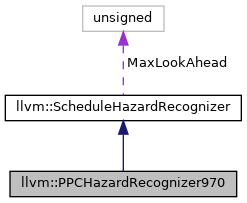 PPCHazardRecognizer970 - This class defines a finite state automata that models the dispatch logic on the PowerPC 970 (aka G5) processor. This promotes good dispatch group formation and implements noop insertion to avoid structural hazards that cause significant performance penalties (e.g. setting the CTR register then branching through it within a dispatch group), or storing then loading from the same address within a dispatch group. Definition at line 55 of file PPCHazardRecognizers.h. Definition at line 263 of file PPCHazardRecognizers.cpp. References llvm::errs(), llvm::MCInstrInfo::get(), getHazardType(), isLoad(), isStore(), LLVM_DEBUG, llvm::MCInstrDesc::mayLoad(), llvm::MCInstrDesc::mayStore(), llvm::PPCII::PPC970_Cracked, llvm::PPCII::PPC970_First, llvm::PPCII::PPC970_Mask, llvm::PPCII::PPC970_Single, llvm::ScheduleDAG::TII, and llvm::MCInstrDesc::TSFlags. Definition at line 424 of file PPCHazardRecognizers.cpp. Definition at line 386 of file PPCHazardRecognizers.cpp. References llvm::SUnit::getInstr(), llvm::MachineMemOperand::getOffset(), llvm::MachineInstr::getOpcode(), llvm::MachineMemOperand::getSize(), llvm::MachineMemOperand::getValue(), llvm::MachineInstr::isDebugInstr(), isLoad(), isStore(), llvm::MachineInstr::memoperands_begin(), MI, llvm::PPCISD::MTCTR, llvm::PPCII::PPC970_BRU, and llvm::PPCII::PPC970_Pseudo. getHazardType - We return hazard for any non-branch instruction that would terminate the dispatch group. We turn NoopHazard for any instructions that wouldn't terminate the dispatch group that would cause a pipeline flush. Definition at line 326 of file PPCHazardRecognizers.cpp. References assert(), llvm::PPCISD::BCTRL, llvm::SUnit::getInstr(), llvm::MachineMemOperand::getOffset(), llvm::MachineInstr::getOpcode(), llvm::MachineMemOperand::getSize(), llvm::MachineMemOperand::getValue(), llvm::ScheduleHazardRecognizer::Hazard, llvm::MachineInstr::isDebugInstr(), isLoad(), isStore(), llvm_unreachable, llvm::MachineInstr::memoperands_begin(), llvm::MachineInstr::memoperands_empty(), MI, llvm::ScheduleHazardRecognizer::NoHazard, llvm::ScheduleHazardRecognizer::NoopHazard, llvm::PPCII::PPC970_BRU, llvm::PPCII::PPC970_CRU, llvm::PPCII::PPC970_FPU, llvm::PPCII::PPC970_FXU, llvm::PPCII::PPC970_LSU, llvm::PPCII::PPC970_Pseudo, llvm::PPCII::PPC970_VALU, and llvm::PPCII::PPC970_VPERM. Definition at line 431 of file PPCHazardRecognizers.cpp.